When you need to use an emergency locksmith you want to be confident that you are using someone who is credible, trustworthy and cost effective. We are DBS checked, fully insured and offer the highest levels of customer service, fully guaranteed workmanship and full peace of mind with a 24 hour emergency response. By adopting simple and effective security precautions, you can deter and discourage burglars and ensure added protection and safety for your home and family. In these days of increasing incidents of crime it is not unnatural for any responsible home owner to feel some concern about the possible threat of burglary. Richard Taylor Master Locksmith, here for all your domestic and commercial locksmith needs. We provide bespoke security solutions to all applications, with a focus on Fire Regulation, DDA compliance, and current Insurance standards. Call today and ask about our special offer on anti-snap cylinders and price match guarantees. If you find a cheaper price we’ll match its and still honour our amazing first class service! We wont be beaten on price ever! I had a key broken in a stiff lock on double french doors, which had been a problem for weeks before the key snapped. I was quoted around £160-£240 by the first listing on google. I tried YELL and found Richard, locally. He gave me a list of prices which were clear, reasonable and easy to understand. He agreed to come the next day at 3-4, and he actually called ahead and arrived half hour early - brilliant. Quick inspection, removed the lock, asked me if i had another key, which i did, and he said £30. WOW - He could have told me anything, and easily charged treble. He then explained sometimes these heavy upvc doors drop out of alignment, he serviced the door, adjusted the hinges, refitted the lock, and charged me £30 - 15 minutes, clean job, boots off, and honest. I never write reviews - This is a first - If you need a locksmith, call this guy !!!!!!! 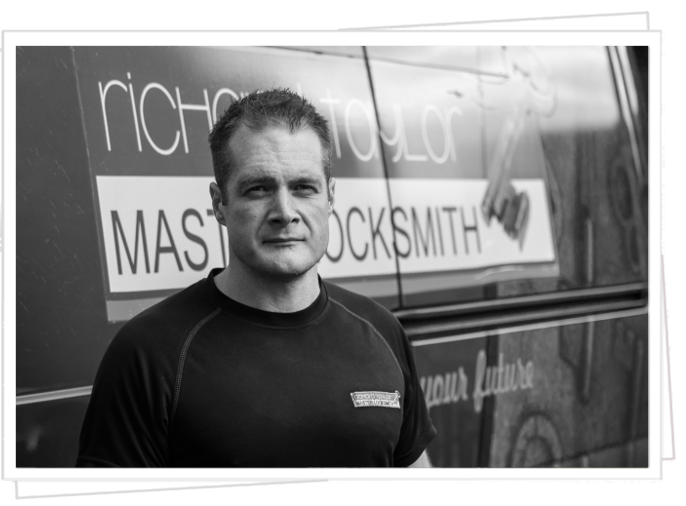 I would highly recommend Richard Taylor Master Locksmith, the service was first class and 100% trustworthy, reliable and great value for money.